“Weekends are never fun unless you’re around here, too,” Smith Westerns singer Cullen Omori intones without irony on “Weekend,” which is to T. Rex what the Killers’ “When You Were Young” is to Bruce Springsteen. (A good thing!) 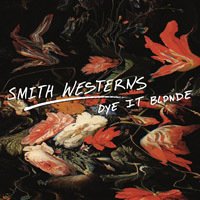 The band’s sophomore album, Dye It Blonde, falls short of the teenage dreams presented so masterfully by then-oldsters the Thrills on Teenager, but it’s both a vast improvement over their roughshod debut and, on songs like this one, about as good as this stuff gets. “Weekend” is anchored by a string-bending guitar hook so fuzzy it could pass for a Tribble as electric open chords and hazy synthesizers (Beach House producer Chris Coady, who knows a thing or two about sounding dreamy, handled this one) float underneath. But Omori’s raw desire is the star here, the lyrics doing whatever they have to to get to the point: “Na, na, na, a girl like you.” Maybe it’s the synths, but “Weekend” is nevertheless a sensitive jam, a song that feels less consumed with boning than it does with holding hands really tight. Ah, youth.